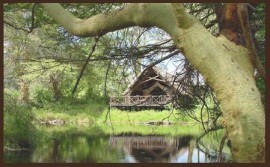 Man Eaters Camp is a luxury tented camp nestled on the banks of the Tsavo River in the middle of Tsavo National Park. 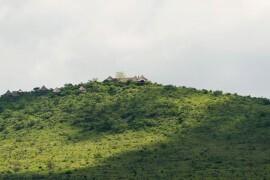 Only 1km off the main Nairobi-Mombasa highway, Man Eaters Camp is an ideal stop over for travelers along the route, with accessibility to both Tsavo East [10km] and Tsavo West [2km]. Across the banks one can view the game coming to the river to quench their thirst from the dry heat Tsavo is so famous for. Accommodation at Man Eaters Camp is offered in 30 luxury en suite tents each with a private balcony overlooking the breath taking view of the Tsavo River where animals come to quench thirst from the famous dry heat of Tsavo. The tents are spacious, beautifully decorated and blend in with the environment. Man Eaters offers privacy and an incomparable luxury accommodation experience. 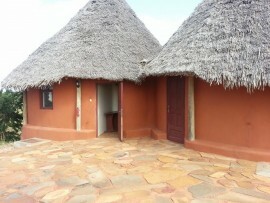 Facilities include a fine dining restaurant, a bar, a lounge, massage facilities and a swimming pool. 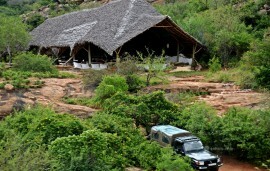 Tsavo West is famous for big game and spectacular views, the ideal area for game drives and nature walks.